Mr Trump’s remarks on the ravages of the storm came at the top of an address in Springfield, Missouri, about the tax code. The president sought to reassure those who had lost loved ones and property. “We are here with you today, we are here with you tomorrow, and we will be with you every single day after to restore, recover and rebuild,” he said. Earlier on Wednesday, Mr Trump tweeted that on his Tuesday trip to Texas he had witnessed “first hand the horror & devastation” produced by Harvey. He wrote that after seeing the widespread damage, “my heart goes out even more so to the great people of Texas!”. But Mr Trump saw little damage during his visit to Corpus Christi – mostly boarded-up windows, downed tree branches and broken fences. And that was through the tinted windows of his SUV as his motorcade took him from the airport to a fire station in a city already nearly back to normal. The president deliberately kept his distance from the epicentre of the damage in Houston to avoid disrupting recovery operations. Mr Trump also visited Austin during Tuesday’s trip, when he met with officials at the state emergency operations centre. 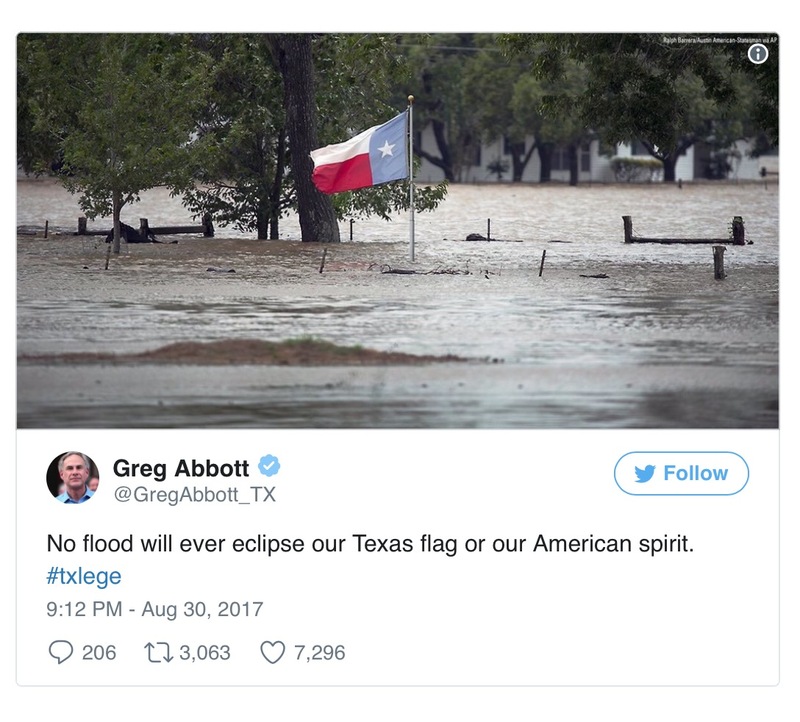 Governor Greg Abbott said Mr Trump showed “genuine compassion” on the short flight to Austin as they watched video footage of the flooding in Houston. “The president was heartbroken by what he saw,” Mr Abbot said. But Ari Fleischer, who served as press secretary to former president George W Bush, said there was something missing from Mr Trump’s remarks in Corpus Christi: “Empathy for the people who suffer.” Mr Trump plans to return to the region on Saturday to survey the damage and meet with some victims, according to White House press secretary Sarah Huckabee Sanders. He pledged that his administration would work tirelessly to help the region recover. “We are going to get you back and operating immediately,” Mr Trump told a crowd outside a Corpus Christi fire station about 30 miles from where the storm made landfall on Friday. Mr Trump was eager to get the federal disaster response right. But he missed clear opportunities to strike a sympathetic note for the multitudes suffering. The president did not mention those who died in the storm or those forced from their homes. He basked in the attention of cheering supporters outside the fire station where officials briefed him on the recovery. Mr Trump plans to return to the region on Saturday to survey the damage and meet with some victims, according to White House press secretary Sarah Huckabee Sanders. He pledged that his administration would work tirelessly to help the region recover. “We are going to get you back and operating immediately,” Mr Trump told a crowd outside a Corpus Christi fire station about 30 miles from where the storm made landfall on Friday. Mr Trump was eager to get the federal disaster response right. But he missed clear opportunities to strike a sympathetic note for the multitudes suffering. The president did not mention those who died in the storm or those forced from their homes. He basked in the attention of cheering supporters outside the fire station where officials briefed him on the recovery.